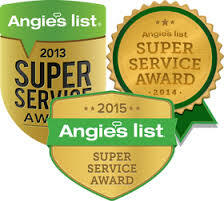 Once again, The Master's Lawn Care team was awarded the Angie’s List Super Service Award for 2016! We are super proud of this award because it is a reflection our team's mission to exceed our client's expectations. While we are definitely proud to get this award because of the relationship our team has with our clients and with Angie’s List, we also are honored because less than 5% of companies that are on Angie’s List ever receives this award. Our staff has won it 4 years in a row. If you see others with this award, take note. It is not easy to come by. There are a lot of users on Angie’s List now, which is good, but then it can be hard to dig through every business on there and find what you are looking for. These award winners are set apart from the rest, and we are grateful to be a part of this elite field. First of all, you have to be located in a city big enough to have enough competition where you could stand out. You have to have a minimum number of good reviews. Your review period grade, which averages the reviews you have received in the last quarter. Seems a little bit like school, doesn’t it? Well, we will definitely take the “A” grade! The great thing about Angie’s List is that any business can get listed on there. It is not a paid directory. In fact, any customer can put a review on any business such as a Gainesville lawn company, mover, contractor, plumber, etc. on Angie’s List. It is our pleasure to serve you, our clients, and we are grateful that we make our community happy enough that you give us great reviews online. In this day and age, that is the way to spread word of mouth about us, so we thank you for being our best form of marketing. Revised: 3/17/17: After winning 2016's award, we have updated this blog from 3-time award winner to 4-time award winner. 2016's award was given out in early March of 2017, and we have continued the honor of exceeding expectations and setting the example for quality work and professionalism in Gainesville lawns.